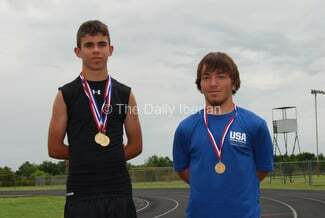 Nicholas Badeaux, left, and Hagan Landry competed at the US Paralympic Championships in San Antonio this past weekend. Delcambre High student Hagan Landry competed in the shot put and javelin at the US Paralympic Championships in San Antonio this past weekend. Catholic High student Nicholas Badeaux competed in the 100 meter, 200 meter and 400 meter runs at the US Paralympic Championships in San Antonio this past weekend. Hagan Landry and Nicholas “Nico” Badeaux show all the signs of being future Paralympics champions. The two Iberia Parish high school students came back from their first U.S. Paralympic Championships with a handful of medals and high hopes for the future after placing in the top five in all five events the two entered this past weekend at the national games at Trinity University in San Antonio. 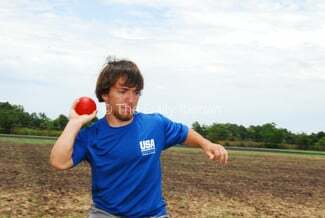 Landry, 18, placed fifth in the shot put and third in the javelin in the F41 division. He will be a senior at Delcambre High School. Badeaux, 15, finished fourth in the 100-meter dash and third in both the 200-meter dash and 400 meters in the T38 division. The youngest competitor at the championships, he will be a sophomore at Catholic High this fall. He has been competing for years, having been inspired to do so by his sister, who like him has cerebral palsy. “Fun and tough” is how Badeaux described the competition. His goal for the next competition is to get better. He’d like to meet A standards to have a better shot at making the Paralympics in Scotland next year. Paralympics athletes compete in divisions based on their abilities, explained Stephanie Lamperez, Badeaux’s mother and coach for the two local teens. Landry is classified in the taller dwarf category (41), while Badeaux is classified in the highest-functioning cerebral palsy group (38). It was Landry’s first Paralympics competition, while Badeaux has competed at the Junior Paralympics level for several years before entering the adult competition this year. Dwarf competitors are classified based on their measurements as either 41 (taller) or 40 (shorter), while the cerebral palsy competitors are classified based on their motor control, she said. Other divisions are for visually impaired, wheelchair athletes (spinal cord injuries) and amputees. “T” designates track and “F” designates field competitors. Both local students qualified for the national Paralympics based on meeting IPC (International Paralympic Committee) standards at qualifying meets — high school meets and the Endeavor Games, an IPC-sanctioned event in Oklahoma City two weeks ago. About 200 athletes competed over the weekend, including notable Paralympians such as Tatyana McFadden, a multi-medal winner in wheelchair racing events, and Blake Leeper, a bilateral below-the-knee amputee who specializes in track events. Landry actually met the standards to qualify for the international paralympics but hadn’t competed in enough meets to earn a spot on the US team. Badeaux met emerging elite standards, meaning he’s getting to the stage where he is drawing notice and will soon qualify for the Paralympics A and B standards. “He needs to get about a second faster in the 100,” noted Lamperez, a pediatric physical therapist who began coaching disabled children in 1991 through the school system and GUMBO (Games United Mind and Body), the state program for disabled athletics. Unlike the Junior Paralympics, which had more of a social atmosphere with barbecues and other get-togethers for athletes, the U.S. Paralympic Championships were all business. Athletes were there to qualify for the national team, and both Badeaux and Landry learned a lot from the experience. Lamperez said she’s looking for a coach to work with her son to improve on his techniques, something she doesn’t feel qualified to do. While he holds eight national records, she said, he needs a coach who can work with him on such things as stride length, when to make his move during a race and other such technical matters. Landry said the competition at the U.S. nationals was intense. Athletes spent the whole year getting ready for nationals, he said, and he learned from that after not making the team for the international games next month in Lyon, France. Landry said the meet was fun, but he also was there to work to try to get to the next level. “It was an experience to get to know people, and their disabilities and how they cope with it,” said Landry was accompanied to Texas by family members. They were proud to see him set world records in the javelin and shot put for his classification, he said. Javelin is his best event, and he looks forward to setting an even higher mark in that event. Badeaux noted the national team javelin and shot put coaches both really liked Landry. Landry said it was exciting to set the records, but not making the national team to go to France was disappointing. He’s set a goal to throw 10 meters farther, and qualify for the national team, but has higher goals. Anyone with a child who has visual or physical disabilities who’d like to compete in athletics can contact Lamperez, or Pam Carey at GUMBO (www.gumbogames.com).